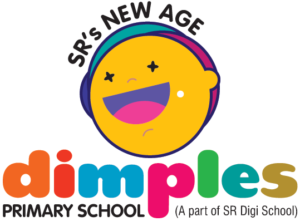 INSPIRE is an innovative programme developed by the the Department of Science & Technology to attract talent to the excitement and study of science at an early age. 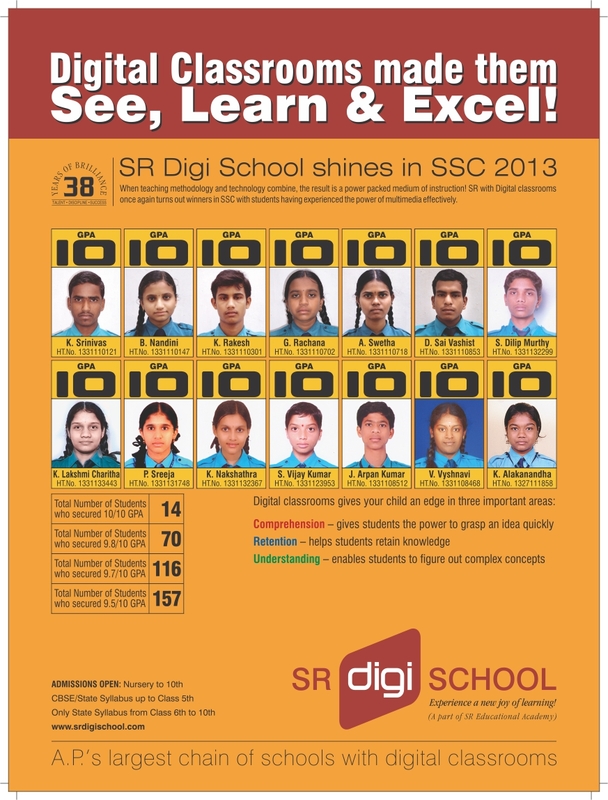 SR Digi’ans have proved once again that “Sky Is Their Limit”. Heartly congratulations to everyone!!! The track record speaks volumes of SR by turning average students into golden achievers in exams. Students have excelled in several national level competitions like Maths and Science Olympiads. SR is proud to showcase students who have performed par excellence in academics as well as other activities. They put in their best efforts and the results speak for themselves. Around 32 students from different classes took the exam and 15 were selected for district level. Around 13 students of different classes participated in the IAMO prelims among which 5 were selected for the mains. Syed Faraz Hussain of IV standard got through the mains and was announced the ‘Amateur Mathematician of year 2010-11’ at the national level. Sai Krishna of VII stood third at the district level drawing competition held at Karimnagar. Around 15 students of different classes participated and 9 were selected for state level. 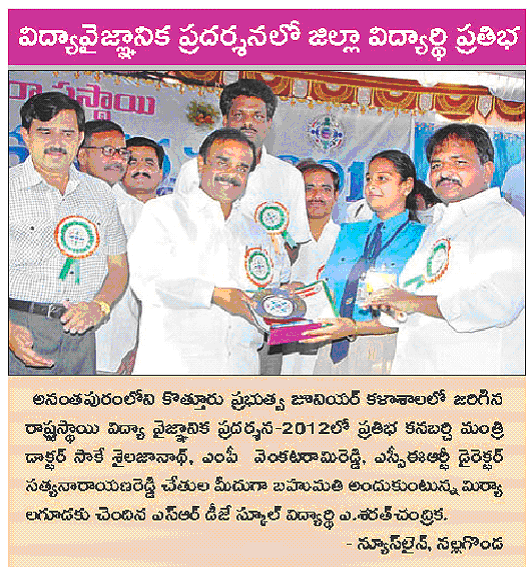 R.Aashika of VIII class was selected at the state level competitions held at Ananthapur. K.Sai Deepthi was selected at the state level competitions. K.Pradeep Reddy was selected at the state level competitions. B.Devi Prasanna of IX class was selected at the district level competition held at Victoria Memorial Residential School in Hyderabad. P.Naveen, N.Sai Kiran and C.Srikanth of IX class were selected for cricket Under 17 years at the district level competitions held at Govt.Boys High School, Ghatkesar. B.Vinod Nayak participated in the National Jamboree Camp at Hyderabad and has been selected for the International Jamboree in Sweden. M.Ravali Krishna participated in the state level Balostav and got 3rd place in Kuchipudi. Also participated in Cilicon Andhra at Gachibowli stadium on 28th December, 2011 in pursuance of achieving a Guinness record in Kuchipudi dance.